If nothing else, this is a variant on Kids “R” Props, with the American Worker as the stand-in. I can only hope that he picked Rudy’s pocket, but it’s not likely. What interests me is how the photograph displays some of the basic roles of the American political campaign in miniature. I’m having to guess about the people in the scene, but I do know the characters they appear to be playing. First, of course, is The Candidate. Usually the center of the picture, here he shares it with The Voter (a.k.a. The Common Man), who would not be there otherwise. White shirt and tie on the left, t-shirt and ball cap on the right: can you guess which is which? 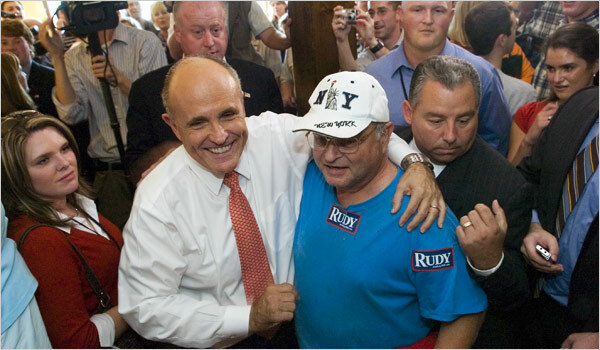 Their happy hug does double duty as it symbolizes both Rudy’s wish that the electorate will cleave to him, and the collective myth that in America elites and masses work side-by-side to form one body politic. Usually we only notice the major roles. I like this photo because it also shows the other players on the stage. The two suits on the right look like Handlers; I’d guess that the one on the far right is Campaign Staff and the guy muscling in is Security. The suit in the left rear probably is the Local Politico. The woman on the left and the tall guy in the blue shirt, who each are wearing the same strap for their ID tag, could be Local Staffers. The Press is left rear, and in the deep background we see the Public milling about, well out of the picture but craning to get a peek or a snapshot. Rudy is posing, probably for another camera. He will meet a lot of people, shake a lot of hands, and smile and smile and smile. Then he’ll do it again and again and again. Most people have no idea how physically and psychologically demanding campaigns have become. Everything and everyone becomes a prop to maintain a 24/7 road show. All politics is performative, but that doesn’t make every performance good politics. Rudy is looking good in this photo, but it also suggests that he is completely scripted. The chances that he will learn anything of value from his good buddy in the ball cap are about nil. About the same odds that a grey-haired worker would benefit from Rudy’s economic policies. The truth of this Democratic Moment is that Rudy might as well be kissing a baby. Photograph by Erik S. Lesser for the New York Times. What’s going on offstage left, I wonder, that the man with the little powershot lookalike is pointing his camera at? Not the whoever-he-is in this photo. You think? Hard to tell with these viewable back whatsernames. I wondered whether it was yet another case of photographing the photographers being more interesting than photographing the axis of the melee.